Nagarajan P, Venkatesan R, J.Mahesh Kumar, Majumdar S.S, Primate Research Center National Institute Of Immunology, New Delhi. India. A fifteen Year old colony born Bonnet macaque revealed alopacia, with active crushed dermatitis’s, accumulation of thick scales and fissuring of the skin during regular health monitoring of the animal kept in semi natural environment .On parasitological examination of the skin sample it was found to be infected with sarcoptes scabiei mites. Papular and vesicular lesions were spread over on the back and head regions of the animal with a flaky and scaly appearance. Ivevermectin at a dose 200microgram/kg/bodyweight S/c for 5 days along with antihistamine, supplemented with B-complex showed effective in treating sarcoptes infection in macaques. This case indicate sorcoptes (Scabies) can also affect macaques apart from domestic animals, and other wild animals such as foxes, wolfs, and gorillas which has been reported earlier. Sarcoptic mange mites are a tiny arachnids that are parasites of mammals causing mange infection and the mites which spend their life on their host causing various skin disorders of which variety are distributed worldwide and may affect domestic and wild animals which includes pigs (Van Neste, et al.) foxes (Scott WA et al., 2003) gorillas (Graczyk, T.k et al., 2001) and in Raccoons (Suzuki, Y., et al., 1981). Fatal death may results if animals are untreated, although considered to be single species they don’t pass from one host to another of a different animal species, transitory infections may occur however especially from various animals to humans and are spread by direct contact. A colony born fifteen-year-old Bonnet macaque (M.radiata) in Primate Research Center National Institute Of Immunology New Delhi, India. The animal was kept in open enclosure (provided with semi natural environment) as recommended by Guidelines for care and use of animals in scientific research –INSA New Delhi INDIA in a CPCSEA registered animal facility. They were fed with commercial pellet feeds/ soaked grams (cicer arietinum) in morning, bread during afternoon and fruits/vegetables were given in evening and they are provided with adlibitum of water .On routine health monitoring of all animals two animals was found with generalized alopacia spreading from head to the back region, There was also accumulation of thick scales in the head and back regions of the animal we suspected for parasitic infection and further investigation was carried out for confirming parasites. 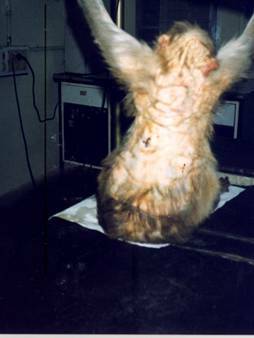 A skin scraping was done after immobilization the animal with Ketamine Hydrochloride @20mg/kg body weight (KETMIN- 50mg/ml). The hairless area are scraped with a drop of glycerin or liquid paraffin put on the skin or scalpel blade before the skin is scraped will aid in the collection of mites (Smith E.K. Et al, 1988). The skin samples are then soaked in 10%KOH for 12 hr, and then mounted on the slide for microscopic examination. Further examination was carried out to rule out the cause. Figures 1 and 2 represent the animal with excessive hair loss from head to back regions with thickening and wrinkling of the skin, Scales and crust demarcate over the skin areas with erythamatous patches at varying degree. The animal's health looked apparently normal other than self-mutilation, itching and plucking its hair. 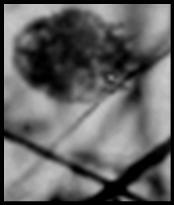 Microscopic examination of scrapings revealed an adult sarcoptes scabiei (Fig 3). The mites were identified morphologically as S.Scabiei. Sarcoptes Scabiei mites are ectoparasites in mammals and human being s but they have host preference although there is no remarkable morphological difference among mites of different hosts (Fainet.al.1968) .Zahler.et al reported that the genus sarcoptes consists of a single heterogenous species genotypically. Sarcoptes infection in humans (Sarcoptes scabiei var hominis) and sarcoptes scabiei was morphologically indistinguishable from each other (Mellanby, k, et al 1972,Fain A., et al 1968 and Kano, R., et al., 1999). Generally sarcoptes mites of an animal origin infected temporary and don’t lay eggs on humans (Alexander, J.O.D., et 1984). The mite burrows into the stratum corneum and feed on cells of stratum granulosum and stratum spinosum. Epidermal damage induces epithelial hyperplasia and the development of parakeratotic crust (YagerJ I.e. al 1993). Sarcoptes infection in animals is characterized by loss of hair, thickening and wrinkling of the skin and scab and crust formation. Severe infection may lead to changes of the skin and death of the animal and the hair become sparse with inflammation and irritation. Sarcoptes mites may develop crust, erythematous macules, and fissures over the skin with foul smelling wet crusted exudates above the head and in severe cases over the trunk and appendages. After confirming the infection by both macroscopic and microscopic examination the animal was administered with Ivermectin at a dose level of 200 micrograms/kg body weight for 5 days (Graczyk et.al 2001) along with antihistamines and B-complex syrup as supportive therapy and gradual improvement of skin conditions were noticed after treatment. We are Thankful to Director NII for providing necessary facilities to carry out this case study. 1..Alexander, J.O D .1984.Arthropods and Human Skin.Springer-V Verlag. 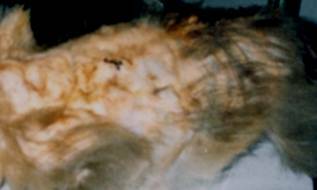 6.Scott WA (2003) Sarcoptic mange in Foxes. Vet Rec. 2003 Feb 8; 152(6): 183. 7.Smith E.K. (1988). How to detect common skin mites through skin scrapings. Vet. Med., 165-170. 10.Zahler, M., Essig, A., Gothe, R. and Rinder, H. (1999). Molecular analyses suggests monospecificity of the genus Sarcoptes (Acari: Sarcoptidae). Int. J. Parasitol. 29, 759-766. All pages copyright ©Priory Lodge Education Ltd 1994-2004.